Guide to more than 70 motorcycle trips, from the Grand Canyon to Bisbee, with crossovers into Colorado, Utah and Nevada. 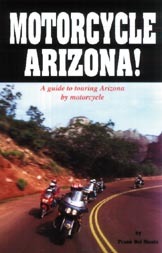 Arizona attractions, lodging, maps, tips on clothing, safety, weather and more! By Frank Del Monte.